I had a game in chess.com which ended as Draw by agreement. The game is here. This is the screenshot of last move before declaring Draw. Is this a real draw? If not, what my best moves as Black? Computer Analysis on chess.com suggest the continuation "39. Qe2 Rf7 40. Nf3 Qc7 41. Ra2 Bf8 42. Qc2 Rd8" saying that "Black has moderate advantage". This is a dead draw. There are no sensible piece sacrifices for either side. Black isn't better here and black isn't worse. There is just nothing any side can do. Edit: I think I'll expand on this a bit, because for some reason the concept of a dead draw seems to be hard to grasp. Positions are usually evaluated based on best play by both sides. That can be tricky because there are positions that should be equal or even favourable for one side, but in practice are more promising for the other side. But in the given position the level of play needed to hold a draw against best play, is very, very low. To put it differently: A 1500 player would have no trouble holding this position with white against Magnus Carlsen. The fact that a computer engine gives a small plus for black doesn't mean black has any advantage whatsoever. It just means that engines aren't yet able to understand completely blocked positions and other kinds of fortresses very well. Black is a pawn and the exchange up. Possibly the computer will give a even better score for black, but the facts haven't changed: This is still A DEAD DRAW. In reference to Chessbrain's answer. I guess this will also answer your Question. Black's White Bishop is the most favourable minor Black piece that can sacrifice itself to capture pawns and gain a breakthrough. Here you are quite right. Usually in closed positions knights are stronger than bishops. But also in this position what is to be taken into consideration is, if white ever plans to create a breakthrough, then his first sacrifice has to be his knight, and if he does so then the knight is off the board. 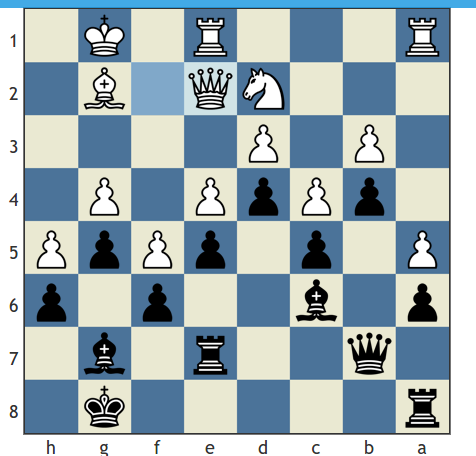 Note that White Bishop can not sacrifice itself as all the Black pawns are on black square except a6 but obviously there is no way white bishop can attack that. If white wants to breakthrough without giving his knight, then sacrificing a rook is too costly to gain any compensation. Related Info: This videos might help you understand similar positions and how to create a breakthrough. In this situation a draw is preferable for black in my opinion, for a few reasons. White has a Knight, which in this position if black ever thought of sacrificing a piece would make that knight an overwhelmingly powerful piece in a closed position game. If black)you) ever wanted to break this stand, you would have to sacrifice a piece in a position where white has more pawns pushed up your side than his. As White however, a risky play is possible, which of course against correct play would normally result in a loss. But white is the only one with the option to actually sacrifice a piece for a potential attack (even though I would recommend against it). Not the answer you're looking for? Browse other questions tagged draw pawns pawn-structure claim-draw or ask your own question. How is this position a draw?